I had a great trip, though not as productive as I had hoped in finding old sugar cane locomotives. 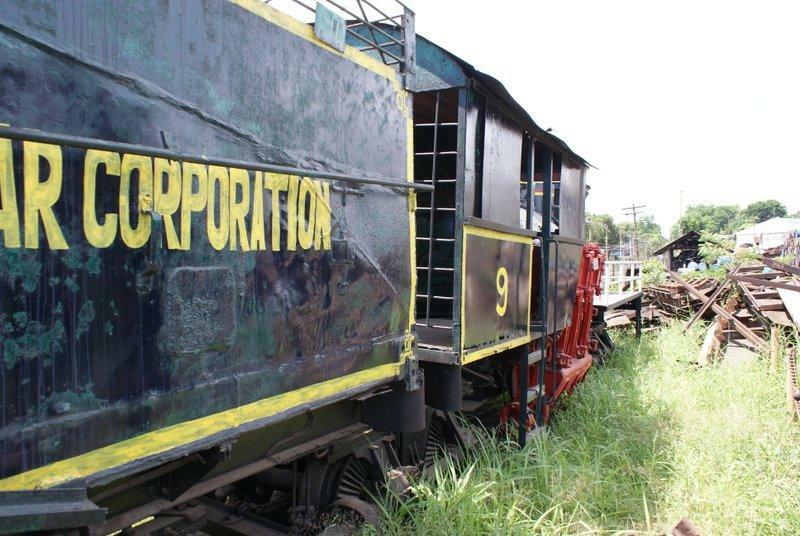 I gained entry to the Central Lopez Mill at Fabrica near Sagay City and I can confirm there are only two Shay locomotives left. One on display outside the entrance and one in the scrap yard. I was expecting at least two in the scrap yard, there was no obvious sign of one having been cut up and my host (the mill H&S manager) was unable to supply any information. There were the remains of Plymouth diesels. I also heard a new reason why the mill stopped using rail to transport the sugar cane. It seems some landowners withdrew access permission for the tracks! Usually the reasons are greater flexibility using road trucks and too many rails getting stolen by scrap metal thieves during the closed season. I again failed to get access to the BISCOM Mill and was told that the two locomotives they used to have had been scrapped and removed. I am uncertain if this was just to get rid of me or was true. I know the two locomotives were in a sorry state. 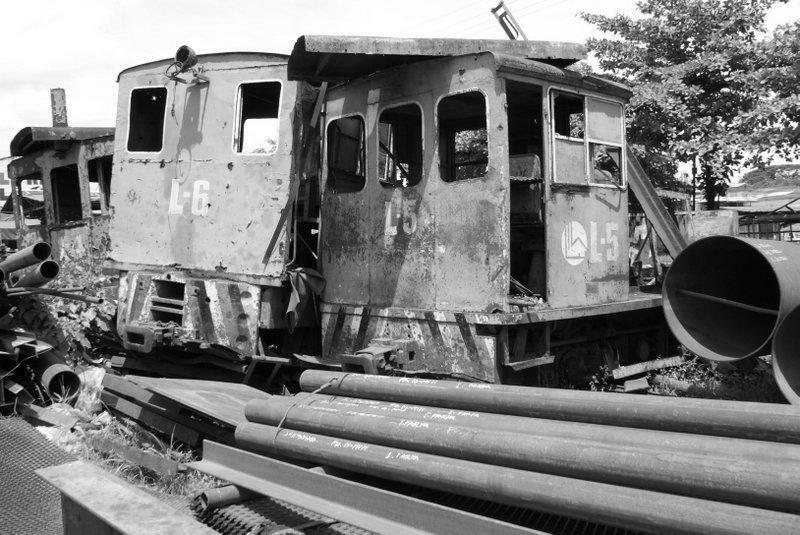 Speaking to a Barangay official in the nearby town of Binalbagan, he thought the locomotives were still there. His information could be out of date. If I am that way again I must see if I can make an appointment with Atty Chiu the manager. 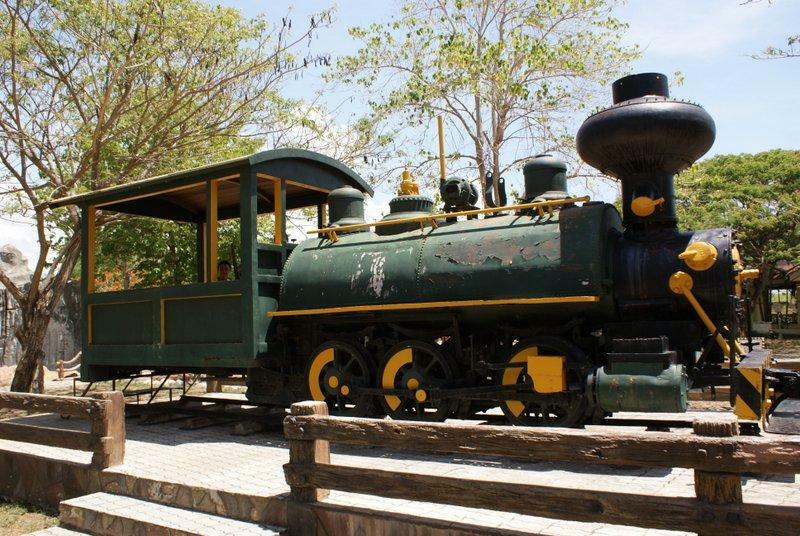 One of the locomotives from the bankrupt mill in San Carlos has been put on display in the 'Peoples Park'. The original cab has been removed and replaced with a wooden structure with bench seating. The courting couple inhabiting this 'cab' were surprised to be disturbed by some nutter (me ) climbing all over the locomotive taking photographs. The locomotive was moved to The Peoples Park and the other locomotives disposed of as too much metal was going missing from the old mill site! The Tourist Office in Sagay City were very helpful. Proud of their rail heritage and displaying the large Baldwin Mallet 0-6-6-0 in the Plaza. They had confirmed for me that the other Sagay mill, Central Sagay, had scrapped all remains of locomotives and rails. I could find no evidence of any other locomotives displayed in the immediate area such as Cadiz City or Escalante. I asked and showed photographs of what I was after, but no locals knew of any. However, on the ferry returning to Toledo I was chatting to an elderly gent who thought there was a locomotive on display in Escalante. Anybody know if this is true? His English was not great so I might have misunderstood. 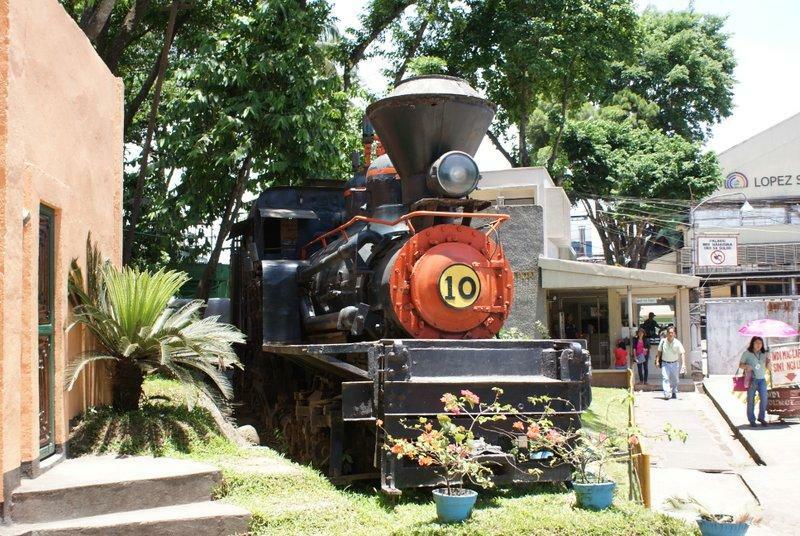 Does anybody know if there is a locomotive on display in the plaza in Hinoba-an in the south of Negros? I liked San Carlos City. The Peoples Park has a nice looking swimming pool, models of city buildings and plenty of space. Carmel's Inn is a delight and great value for an aircon double room at 790Pesos a night. I crossed to Iloilo. I could discover no evidence of any locomotives or rail relics remaining in the immediate area of the City. Unfortunately I did not have time to cross to Guimaras Island. I would have liked to explore further. The Ceres Bus from Bacolod to San Carlos via Don Salvadore across the central mountains is a great trip. The road seemed in good condition except in one place. Great views, rice terraces (not as amazing as the ones at Batad, Luzon), fir trees. I was in the aircon bus so no photographs, nor could I tell how the temperature dropped as we climbed. Sit on the right for best views through the mountains and the left for best views across the Tanon Straights as the bus emerges from the mountains. Anybody know how old the rice terraces are on Negros, as the ones around Banaue are thought to have been started about 4000 years ago and largely completed by 2000 years ago? Before my trip I was searching on the internet for accommodation options in Sagay City. One place that caught my attention was the C-Chen Resort in Old Sagay http://cchenparadiseresort.com/ I could not contact the place and the mobile phone numbers supplied were not active so I ended up staying elsewhere. Looking on Wikimapia the resort is obviously not where it is marked, it is further away from the Pier. If I understood correctly when I was in Sagay I think somebody said the access road floods and is impassable at high tide. I am intrigued and wondered if there was an interesting story behind the building of this resort? So thanks once again for all comments. I can confirm that Sagay is safe, certainly I never felt threatened when I wandered about. places to view in the Philippines? I saw nice examples of passenger steam in Thailand! Edited May 9, 2013 by Thelandofku-an! A number of examples displayed around Bacolod including Panaad Park. One at the entrance to Victorias Mill - no idea if further examples inside the Mill. Management have a no photography policy. One at entrance to San Carlota City. Multiple locomotives displayed inside the Mill grounds plus many piled up derelict. In 2010 two were working in Hawaiian Philippine Mill, plus a number stored in red oxide paint to preserve them. The Mill was still using rail powered by Plymouth Diesels. One on display by the road approaching Bais from Dumaguete. In 2010 the Mill was still using rail with Diesel power. 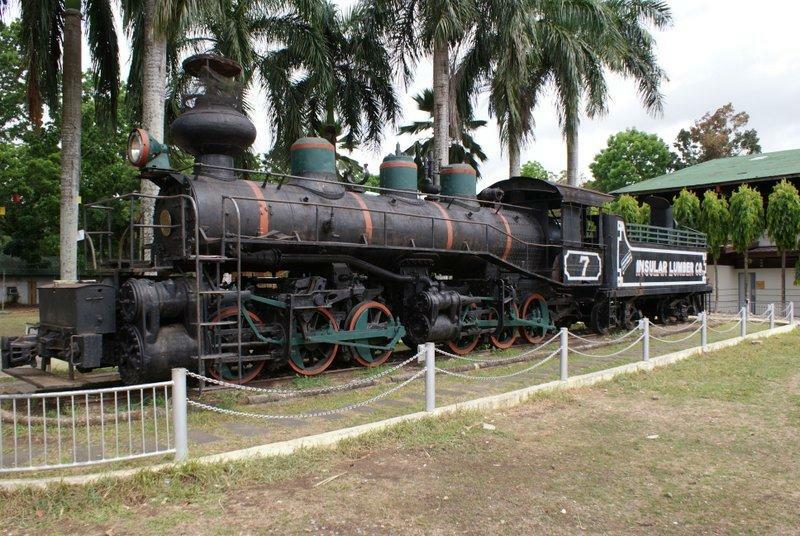 One British loco on display in Bogo-Medillin mill north cebu Island, a couple of diesels on display in town plazas nearby. Plus the locos identified in the original post above. The Philippines could do with a Transport Museum to cover not just rail, but the evolution of the Jeepney and also developments in the inter island ferry service. Sad so much heritage is being lost. I guess in 30 years or so even many of the locomotives on display in town plazas will be piles of rust and lost forever. They should be stored indoors. Thanks for the info, that's on my family travel map for "lunch breaks" ahem! little to see in the way of embankments or cuttings, one or two converted buildings remain and a few photos! I live on Cebu and Negros. I have been through Hinoba-an numerous times, and spent several hours there on more than one occasion. I know of no Locomotives there. Since you were so close, I'm surprised you didn't check out the one in Bais. It is a shame that they havent made use of them as a tourist attraction. There are MASSIVE numbers of people (not just me) who will travel just to see working steam locomotives. If they wanted to scrap them, then sell them on the open market. They would fetch far more than the scrap value and would be restored to their former glory. I did in 2010 thanks. Did not get into the Mill so there may be treasures in there, but I went out to the jetty and got a ride in the cab of a service train. I will explore more of that area in due course. I take time to enjoy areas apart from Mills and trains. I took a copy of Railway Magazine with me. Showed the owner of Samcor Travellers Inn in Sagay who I think is on the City Council and also the staff of the tourist office all the adverts for trips to visit foreign lines. It did not trigger any light bulb moments, just polite disinterest. Same thing happened in the Provinicial tourist office in Bacolod. ^^ That's in a scrap yard near the city. In fact, I passed by where it was located a couple of weeks ago. This one is by far the most impressive, at least for me. Many thanks for this. Can you indicate whereabouts it is situated so I can track it down on my next visit. It is most intriguing, it looks like a typical Baldwin loco with a cab from a diesel. I would love to know the history of how it got like that. The cars look interesting as well. In fact looking at the two photos the engine is in a different place in each and the cab roof is different. Curiouser and curiouser. It is impressive and you can find a photo on the web of it in action in the 1970s taken by Colin Garrett the railway photographer. I think search for Siete Iron Dinosaur. To me the Shays are more impressive if only because of their unusual, but effective, drive arrangements. Vertical cylinders and a horizontal drive shaft along one side of the loco. The boiler offset to counteract the weight. As far as I am aware the only working examples are in the USA and I am going to have to try and overcome my aversion to the 'wonderful' TSA to see one in action. Edited May 10, 2013 by Thelandofku-an!